All Rock-Ola Jukeboxes Feature Exceptional Quality And Expert Craftsmanship, And Are Made In America! Rock-Ola Jukeboxes have achieved the near impossible by creating a series of classic jukeboxes utilizing the most sophisticated technology available today. World-wide, the name Rock-Ola means Jukebox! As a major distributor for Rock-Ola Music Centers and CD jukeboxes, once you make your selection, we will arrange shipping to you directly from the Rock-Ola Jukebox Factory. Check out the total line of Rock-Ola Jukeboxes below. 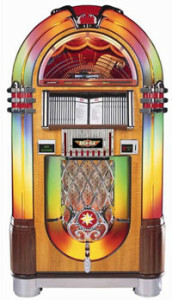 If you have any questions about our Jukeboxes contact us. One of our retro specialist will be more than happy to help you out. 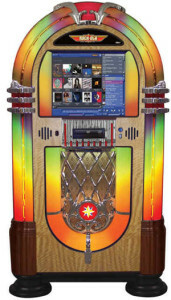 If you have any questions about our jukebox restorations give us a call. One of our retro specialist will be more than happy to help you.